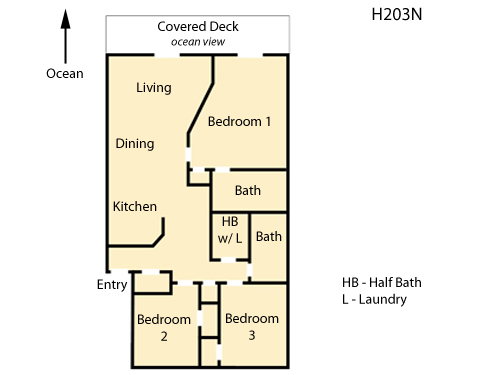 This open-concept, 3-bed/2.5 bath oceanfront unit offers all the benefits of a typical beach house combined with the conveniences of a condominium complex. Perfect for a group of friends or a couple of families with kids, guests staying here enjoy a large, updated space; a 300-SF balcony overlooking the beach; plus covered parking; elevator access (no lugging suitcases and groceries up flights of stairs! ); and a community beachfront pool and grill. Well-stocked kitchen opens to a dining and living area that includes a large table perfect for big group dinners, tall windows that frame a sand-and-sea landscape, and plenty of space for lounging or late-night card games. Modern amenities throughout the condo include wireless internet, TV and Blu-ray/DVD home theater system with surround-sound in the main living space, TVs and DVD players in all bedrooms. The huge master bedroom includes an en-suite bathroom with soaking tub and separate built-in shower and a seating area with balcony access. In addition, there’s a queen bed and a kids’ room with two sets of bunks. The highlight of this beach pad, however, just might be the 30’x 10’ balcony: rivaling that of a single-family home, it offers beautiful ocean views from its third-story vantage point, deck furniture—including pub-height seating and a large table for outdoor dining. Centrally-located in Nags Head, the complex is a half-mile from a major grocery store and the Outer Banks Mall, a 5-minute drive to popular spots like the refurbished Jeanette’s Pier, outlet shopping, and Jockey’s Ridge, and single-stream recycling drop off is available two blocks away at the Nags Head Municipal Center. This perfect vacation home delivers all the features, comforts and amenities one hopes for on a beach getaway! Parking for 2 cars, Non-Smoking, No Pets. Ask about our Military discount. This week has been wonderful! Lots to do in the area. Very family oriented. Weather was absolutely gorgeous!!! We had an incredible time during our stay even though it rained hard for the entire week we were there. This was our first trip to OBX. We really enjoy our vacation. The condo was very comfortable, clean, and nicely furnished. I loved the large deck which had a wonderful view. The location was great- close to the supermarket and restaurants. You just cant beat the oceanfront location. Very nice condo and well prepared by Village Realty. Comfortable furniture. Much to do with great restaurants nearby. 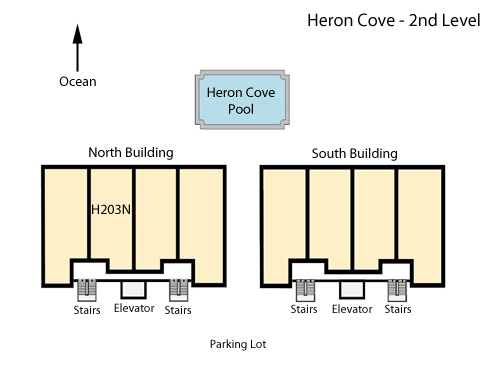 Been to Heron Cove several times, first time in this unit. Love the furniture and the master bath is beautiful! Great week! Will be back. The accommodations were excellent. Great location. Beach was outstanding. Very clean. I would rent again.